So how well does a Slovakia-born bartender know about Singapore? For instance, we were told Italian immigrants were very much present in Singapore back in the days, where Buona Vista may seem likely to be the place of origin due to its Italian name (means ‘good view’, btw). As we, these dimwitted Singaporeans, only just wrapped our heads around the fact that Buona Vista is made up of Italian words, Bar Manager Adam Bursik rattled on, telling us the makeup of the destination drink ($23) – hazelnut chocolate liquer and cold brew coffee, two very Italian ingredients. 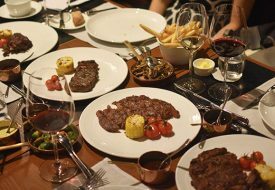 As cocktails flowed, more ground in Singapore history was covered at the recently-opened Origin Bar & Grill, located at the Shangri La Hotel. 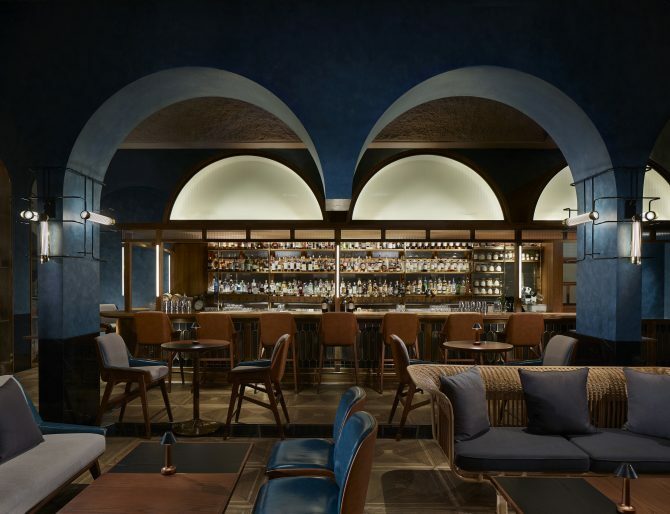 Reflecting the same opulence of its host, the bar is bedecked with vintage wooden tables and rattan couches that nicely contrast the midnight blue walls. Everybody was turned into a mystery that night, all concealed behind a veil of shadows with soft ambient lighting set to its lowest. Aside from the table lamps that dotted the room like fireflies, the main bar shines the brightest, distinctly showcasing its intended steam train embodiment that romances voyage and adventure. We then hopped on board this metaphorical train and traversed across the five neighbourhoods, where our nation’s heritage is celebrated and multiculturalism is showcased best one cocktail at a time. “I personally don’t really like 90% of the cocktail menu,” confessed Bursaik, maker of the cocktail menu when asked of his three-month creation process. Because unlike his preference for a stiff and complex drink, the Slovakian noticed Singapore’s taste buds lean towards light and refreshing drinks, evident by the bar’s two best-selling drinks Origin ($22) and Sanic ($22). Belonging to the Boat Quay district where trading took place along the river, the latter pays a fizzy ode to the Japanese settlers with its citrus concoction of kumquat, yuzu, tonic and sake. However, it is the former that titillates our senses. From the Orchard, the Origin exemplifies a harmoniously blended cocktail, where ingredients do not outshine each other in terms of flavour. Laced with gin, the namesake cocktail is concocted with sugar cane honey and lime wine – an ingenious component made by Bursaik who soaked limes in wine, along with a splash of pisco for preservation. 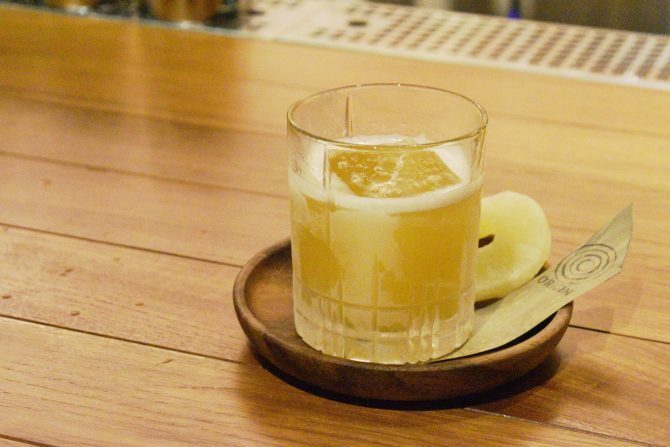 For something stronger, look to Chinatown’s Safari Tea ($23), a cocktail that brought our attention to Bursaik’s homemade jackfruit marmalade. Yes, marmalade in the drink, blended with bamboo and osmanthus fortified wine and shots of Monkey Shoulder. The results is a fruity, tropical nightcap with a kick. Little India’s Leaf The Curry ($23) is also a worth a sip, seeing how it is Bursaik’s favourite. 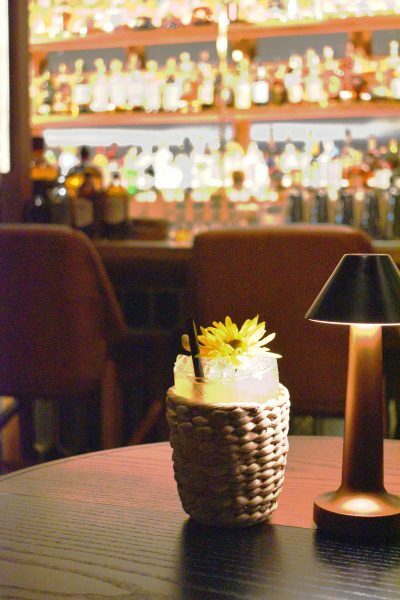 Here, you’ll be presented a complex cocktail that boasts tamarind juice and aged rum. The railway expedition halted at the tracks of Marina Bays Sands, a hood where the Slovakian bartender deemed as a place of limitless possibilities. 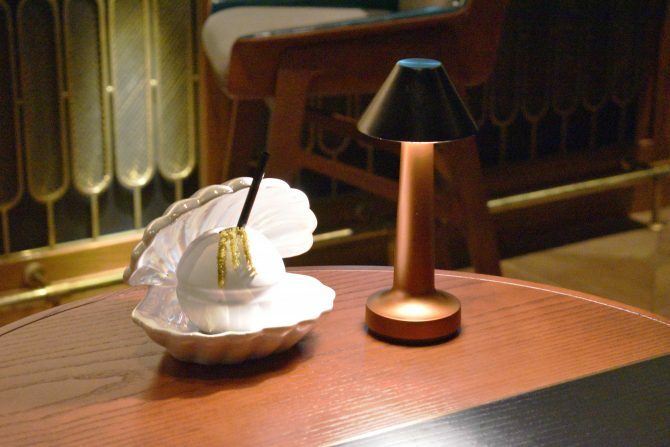 Repping this hood is The Pearl ($26), a concoction presented in a pearl vessel, further nestled in an oyster shell. Tofu, with dashes of almond and rose powder, is blended until it turns to liquid, before strained and combined with shochu and black forest gin. Think of it as a spiked version of an almond tau huey drink – smooth, creamy and sweet. Previous PostHere’s Why You Should Catch The Asian Premiere Of Evita The Musical In Singapore Next PostTaste Test: Is Old Chang Kee’s New Nasi Lemak Puff Sedap?